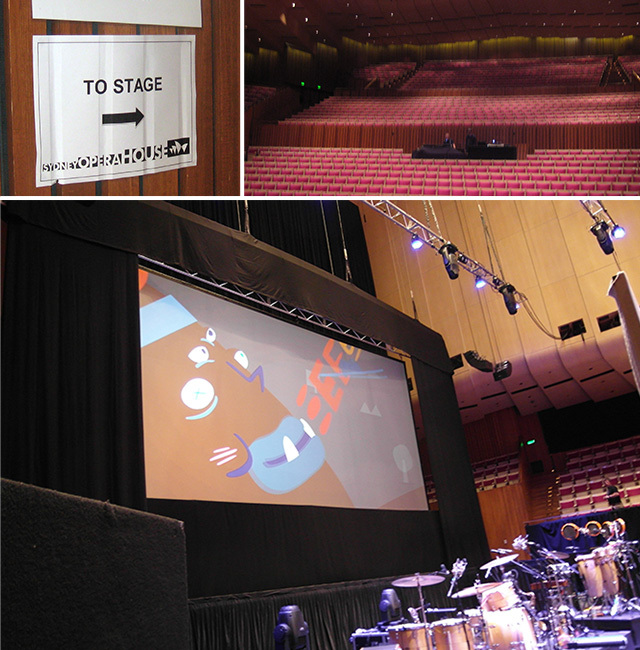 Last weekend the ZZZ collective, consisting of Okayboss, Marko and I, was invited at the Sydney Opera House to be announced as the winner of the animation competition. We were really surprised to have been selected by the judges, but we worked hard through all the rounds and it was an honour to receive the top prize for creating Run Amok. 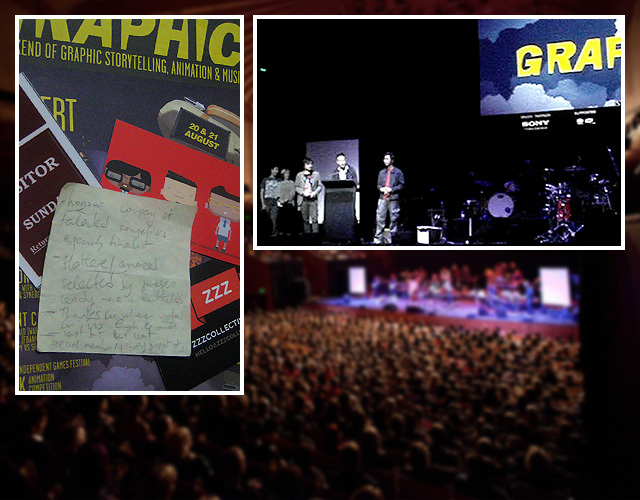 The announcement was to be made just before the final event of the Graphic 2011 festival: Gotye concert. There was a quick rehearsal before the show in the empty hall, but even then my legs were shaking as I am so much more comfortable sitting quietly and animating in front of my computer. Backstage and then on the stage, with Run Amok. Then came the big moment. Run Amok was projected inside the packed Opera House, which was a first by itself, but I was too nervous at that time to realise. Each one of us agreed to say a few words, even I did but I can't remember why now. Fortunately I had my part of the speech scribbled down on post-it note! It was a short nervous speech at the Sydney Opera House but well prepared on a post-it note. After the speech it was such a relief and just a matter of going back in the audience and enjoying the mind blowing show by Gotye. On our way back to the car park, it was also nice to be congratulated by random people from the crowd who recognised us. Awesome night. Thanks to everyone who voted for us and supported us through the rounds of the competition as it was the first piece that ZZZ Collective created, the first of many to come... so like us on Facebook, follow us on Youtube or Twitter to keep in touch!